FACE Stockholm: natural, trend-forward, simple, clean, gorgeous and fun! Hi ladies! Today I'd like to talk about a Swedish beauty brand available in UK, USA, Eire and many other countries in the world. I'm talking about FACE Stockholm! FACE Stockholm is the cosmetics company bringing makeup and skin care that is true to the Swedish beauty ideal—natural, trend-forward, simple, clean, gorgeous and fun! FACE Stockholm offers a spectacular range of colours with more than 200 lip shades, over 150 eye shadows, blushes, foundations, powders, professional makeup tools, and a natural skin care line. Only the highest quality and most natural ingredients are used. All products are hypoallergenic, do not block pores, use minimal packaging and are never tested on animals. The FACE Stockholm customer consists of women and men from a broad range of ages and ethnicities. Celebrities, fashion, entertainment and cosmetic industry professionals have also come to rely on the FACE Stockholm line of cosmetics, skin care and makeup tools. Every FACE Stockholm store is staffed with professional makeup artists who are the top talent in the business, yet are unpretentious and approachable. 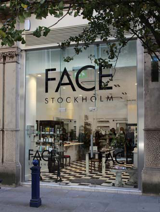 FACE Stockholm’s intimate retail spaces create a friendly, easy atmosphere, where you will find the products that help you look your best. Customers are provided with honest and current information about colour selection, makeup items, skin care and application techniques. This information is presented in a way that the customer can most effectively use in his or her life. Established in 10 countries worldwide, FACE Stockholm returns to the UK in October 2010 after a number of years. Founder and owner, Gun Nowak, had been looking for the right person to lead the brand in the country for some time and when she met Mark Gardiner in 2009 she knew he was the man to head the expansion into the UK and Eire. The first store, on King Street, Manchester, opened in October 2010. Situated in one of the city’s most upmarket shopping areas, FACE Stockholm sits among neighbours including Vivienne Westwood, Hermes, Emporio Armani and DKNY. The brand is the brainchild of Swedish-born Gun Nowak and the company is now run by Gun and daughter Martina Arfwidson. As a fashion boutique owner in the 1970s and 80s, Gun became tired of being unable to find makeup colours to match the bright neon fashions of the day. Her solution – to make them herself. Her creative flair ensured that from her first shop, opened in 1980, FACE Stockholm was an instant success. By 1990 the brand had established stores in New York City. FACE Stockholm products are now available at 50 locations worldwide, through mail order, via the internet and include a hotel amenities line as well as an eyewear collection. FACE Stockholm is actively engaged in supporting and advancing the art of makeup application and helps educate future artists through its professional makeup schools that currently operate in Sweden, Norway and the USA. A FACE Stockholm school, teaching creative, cutting-edge makeup application to the next generation of makeup artists, will be opened in the UK in the near future. FACE Stockholm products are available for purchase in the UK and Eire through the website: www.facestockholm.co.uk . o MAGIC WAND – £22.50 – Flawless skin is just seconds away! This magical wand does wonders to highlight and conceal. A sleek silver wand with brush applicator makes this all-in-one product the perfect travel companion. With Purified Water and Lecithin, this concealer will leave your skin protected and moisturised while hiding all surface imperfections. o CORRECTIVE CONCEALER – NEUTRALIZER BLUE – £18.00 – Enduring concealer that works over time to camouflage surface imperfections. Perfect for dark circles and blue veins or bruising. The results are truly amazing! FACE Stockholm is established in the USA, Sweden, Norway, Denmark, Germany, Spain, France, the Netherlands, Italy and New Zealand. Have you ever tried this brand? I honestly find it really interesting and I's love to test some of their products! Anch'io ho da poco scoperto questa marca ma non ho ancora provato niente anche se mi piacerebbe molto. I prodotti sembrano molto interessanti.